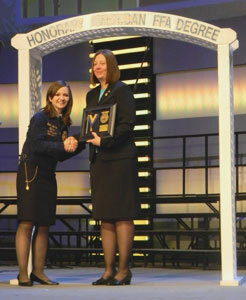 Leda Schreiner of Chillicothe, MO was selected to receive the Honorary American FFA Degree - Teacher. 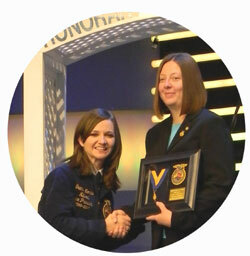 The award is given to those who advance agriculture education and FFA through outstanding personal commitment. The National FFA Organization works to enhance the lives of youth through agriculture education. Without the efforts of highly dedicated individuals, thousands of young people would not be able to achieve success that, in turn, contributes directly to the overall wellbeing of the nation. The Honorary American FFA Degree is an opportunity to recognize those who have gone beyond the valuable daily contributions to make an extraordinary long-term difference in the lives of students, inspiring confidence in a new generation of agriculturists. Recipients in the teacher category are selected on the basis of their contributions in the following seven areas: classroom/laboratory instruction, experiential learning of students, National FFA Organization, building partnerships, agricultural education program marketing, agricultural education program development and evaluation and professional development of agricultural education teachers. In addition, teachers must have taught for a minimum of 10 years and their agriculture education program must have 85 percent membership in the past year. Members of the National FFA Board of Directors approved the nomination. Leda traveled to Indianapolis to receive the honor during an onstage presentation at the 84th National FFA Convention on October 21, 2011. All recipients received a certificate and medal and their names will be permanently recorded. The National FFA Organization, formerly known as the Future Farmers of America, is a national youth organization of 523,309 student members - all preparing for leadership and careers in the science, business and technology of agriculture - as part of 7,487 local FFA chapters in all 50 states, Puerto Rico and the Virgin Islands. The National FFA Organization changed to its present name in 1988, in recognition of the growth and diversity of agriculture and agricultural education. The 84th National FFA Convention draws 50,000 plus FFA members, advisors and guests from across the country. The FFA mission is to make a positive difference in the lives of students by developing their potential fro premier leadership, personal growth, and career success through agriculture education. This page updated by BK Web Works 02/16/2019.